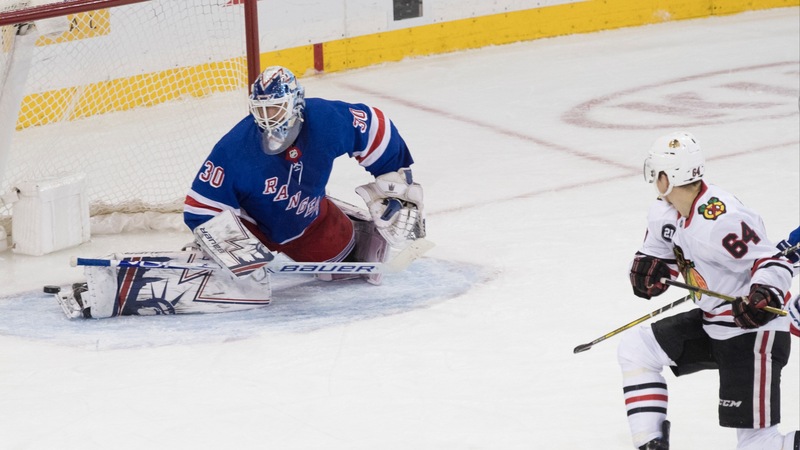 Those who bet the Rangers -1.5 goals or UNDER 6.5 for Thursday's Chicago-New York game are still in utter disbelief of how the final seconds played out at Madison Square Garden. So say you and a few friends decided to have a guys night Thursday to watch the Blackhawks game. They're [in last place](https://www.nhl.com/standings/2018/conference), but they're playing the Rangers at Madison Square Garden, so the allure of an Original Six matchup piques your interest. Though you're a fan, you know Chicago (16-24-9) is struggling this season, so you throw a few bucks on either the Rangers -1.5 goals or UNDER 6.5 for the total (maybe you even parlay it) as another way to keep yourself interested. You have a few beers, maybe some chicken wings, and when Mika Zibanejad nails any empty-netter with less than 18 seconds to play to give New York a 4-2 lead, you're ending the night happy, full and with a little more money in your pocket/online account. Life is good. Until it isn't. __MORE:__ [NHL Week 16 preview](https://www.betchicago.com/nhl-week-16-preview-lightning-predators) ## Blackhawks-Rangers bad beat Rather than roll over down by two, after giving up 12 goals in two games in the Metropolitan Area (after an 8-5 loss to the Devils on Monday), the Blackhawks kept fighting. David Kampf flipped the puck out from the boards with two Rangers defenders closing in, Drake Caggiula brought it into the zone and left it off for Dominik Kahun, who slid a wrister passed Henrik Lundqvist's outstretched right leg. The final buzzer actually sounded simultaneously with the goal light, but it was ruled one second and change were still left when the puck crossed the line. You've got to be kidding. Skip to the 3:42 mark of [this video](https://www.nhl.com/video/embed/recap-chi-3-nyr-4/t-300041246/c-65024603?) to see where the fun started... So rather than cash on Rangers -1.5 anywhere from +195 to +210 and/or UNDER 6.5 goals at -105 or -110, you lost either way. Oh boy. __PLAY:__ Our [Chicago NHL Puck Drop](https://betchicago.chalkline.com/games/chicago-nhl-puck-drop) before Sunday's Capitals at Blackhawks game.